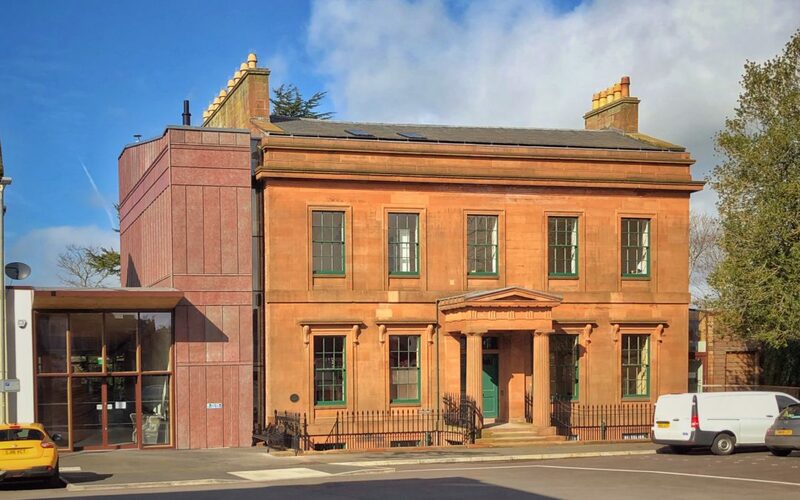 Moat Brae, the new National Centre for Children’s Literature and Storytelling, is welcoming new members of staff aboard ahead of preview activities in May and fully opening its doors on 1 June. The beautiful Georgian house in Dumfries is where JM Barrie played the games that inspired Peter Pan. It has been restored and transformed by the Peter Pan Moat Brae Trust (PPMBT) following £5.8 million fundraising campaign. From early May Moat Brae will be hosting a number of events and running some preview tours (including for J M Barrie’s birthday on 9 May) for schools, organised groups and the public. This will be followed by the full public opening in June. Moat Brae has just appointed a Head Gardener, Café Manager and an Administrator, with further posts due to be advertised soon. The full team will include 18 employed staff (10 full time) and the centre is expected to attract 31,000 unique visitors a year, contributing an extra £1.3m to the local economy and to the regeneration of Dumfries. Simon Davidson, Moat Brae’s Centre Director, said:“It’s a real pleasure to welcome the new members of our team as we make the final preparations to open our doors. “The restoration of Moat Brae and its transformation into the new National Centre for Children’s Literature and Storytelling has really caught people’s imaginations and they are looking forward to being part of its story. “We are looking forward to JM Barrie’s birthday on 9 May and have a series of small preview events and other activities taking place throughout the month to test operations and make sure we can offer visitors the best possible experience. As well as being an international visitor attraction for Scotland, Moat Brae will also become a valuable national resource, playing a significant role in the development of the region and its community. A variety of volunteering opportunities are being created for people who would like to get involved by contributing to visitor services, events, tour guiding or caring for the Neverland Discovery Garden. Moat Brae will celebrate its heritage and connections to children’s literature through interactive exhibitions, discovery trails, events and educational programmes. It will provide a magical environment and a resource for people of all ages to play, learn and be inspired by the place JM Barrie referred to as “Enchanted Land”. It will have a café overlooking the River Nith, a shop, play and activity spaces and will also offer rooms for hire to creative groups and for conferences, weddings and corporate events. Paula Ward, VisitScotland Regional Leadership Director,said: “The opening of Moat Brae will propel Dumfries & Galloway into the spotlight, sprinkling its magical fairy dust across the region and highlighting everything it has to offer. “We hope that people young and old will feel inspired by the boy who never grew up and be transported back to childhood in a place where their imagination can run wild, drawing visitors from far and wide, growing the economy, creating jobs and sustaining communities. “From rich history and stunning landscapes, to epic adventures and exciting festivals and events, Dumfries & Galloway encapsulates all that is great about Scotland. Scotland’s reputation as a quality destination relies on continued investment to ensure that current provision meets future demand. Angela Green: Café Manager. Many will already be very familiar with the excellence of her work. Angela set up the hugely popular Mrs Green’s Tea Lounge in Dumfries and worked with nearby The Stove Café when it was starting up. She has an immense talent for creating cafes of real character and – of course – ensuring that the food is superb. Jacqueline Kennedy: Administrator. Based in Dumfries, Jacqueline has enjoyed a successful secretarial career previously working for the local authority, SRUC Barony and most recently G M Thomson & Company. She is looking forward to working at Moat Brae because it offers a new challenge and is a chance to help build something that will be of value to the local community and to future generations of children from all over the world. Matt Lidster: Head Gardener. Matt is from Thornhill and has been running his own gardening business for more than 15 years. He was attracted to the job because of the variety, the chance to meet the public, run open days and lead tours. When he’s not working in a garden he says he’s normally got his head in a book about gardens. For more information please contact Simon Davidson 01387 255 549 or Catherine Colwell 01387 255 549/07793 488 439.